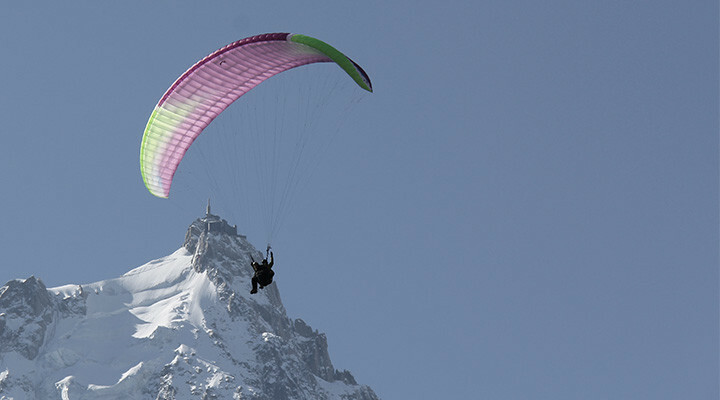 Mountain lovers, paragliding experts and accomplished mountaineers for more than 25 years, we created Absolute Chamonix to allow you to share in our passion for paragliding. The team is headed by Lionel and Caroline, multiple french champion and Paragliding World Cup winner. Tandem flights are available throughout the year. A wide variety of takeoff sites are available nearby, allowing us to easily choose the one most suited to the cable car schedule, the weather conditions and the type of flying you desire. During the winter season, we offer speed riding classes. 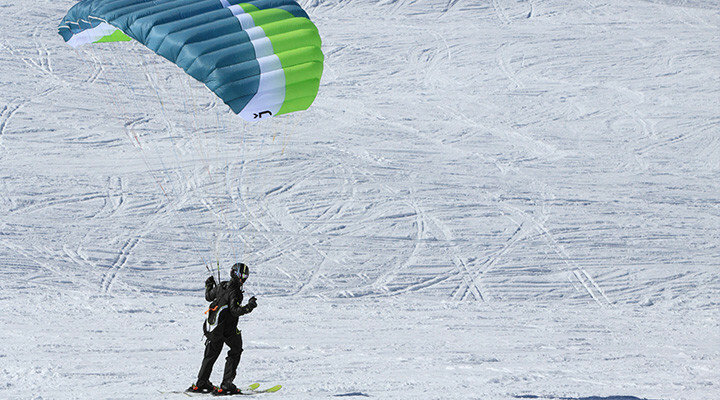 Speed riding is easy and (for good skiers) loads of fun from the get go ! Equipped with a small manoeuvrable wing, you’ll find yourself barely skimming over the powdery snow, then taking off and flying super fast right above it. Our cross-country courses are reserved to competent pilots who wish to improve on their flying skills and get some distance under their belt. We offer a choice of packages well suited to your skill and experience levels. 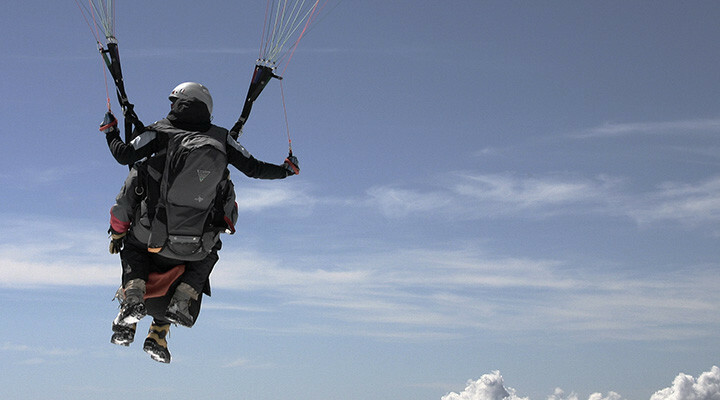 Our personalised paragliding and speed riding gift cards are sure to please them. We are proud of having earned the Label de qualité from the French Paragliding Federation. All of our wings are equipped with reserve parachutes and airbags. 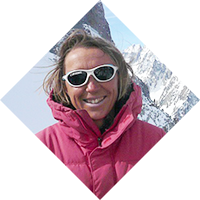 Rich from their 25-year experience and high level athletes, Caroline Brille and Lionel Pouzadoux are the founders of Absolute Chamonix. Come share their passion for paragliding and speed riding and enjoy the ride in full safety, good fun and a friendly atmosphere. Caroline has massive paragliding experience. A high level athlete, she has earned 15 podiums in Paragliding World Cup competitions and reigned as french champion for 5 years in a row. She also won the tittle of World Vice-Champion in team competition. Never one to rest on her laurels, the later became the first woman ever to land her paraglider on the summit of Mont-Blanc. 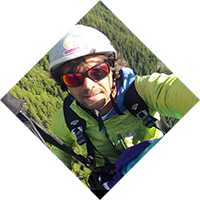 Not only is Lionel an accomplished high-mountain guide and a dedicated paragliding instructor, he is also a hugely experienced alpinist, chamois-like climber and expert paraglider. He has always been the obvious leader in our legendary sorties, as was the case during our 2009 flight up and landing on the summit of Mont-Blanc. Lionel knows the Mont-Blanc’s massif like the back of his hand and will not only guide you through it, but share his vast knowledge of its geology, flora and wildlife. Safety comes before anything else. The simple fact that we will always be in the air with you should be of comfort. You will benefit from our wealth of experience. Our seasoned instructors are all state certified and properly insured. They will cheerily welcome you and always find the words to reassure you, should you require it. Friendliness and good fun are always part of the mix. Our passion is what moves us and we love to share in it with you.